Some manufacturers claim that the color of the bath indicates what areas have allegedly been cleansed of toxins: black for liver, orange for joints, green for gall bladder, and so on. 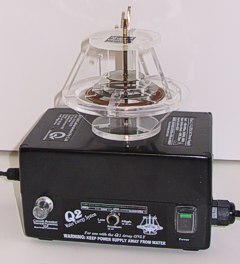 Critics say that foot detox machines are simply AC/DC transformers attached to ferrous electrodes that corrode to generate rust (producing "brown" color) when used to electrolyze the saline water in the footbath. The different variations in color can be accounted by varying amount of salt added to the water and variations in the compositions of the electrodes. It's just a simple chemistry called electrolysis. The water will change color regardless, whether there are feet in the water or not. Dialysis results from several sources also show that the brown stuff that appears in the bathwater is iron-based, and that the bathwater showed no sign of urea or creatinine, supporting the fact that detoxification does not apply. Some critics say that companies are using the change in water color to impress the general public and no more than a sales pitch. They also say that manufacturers use pseudoscience of toxins, bio-energy, bio-stimulation, cellular energy, and other science jargons to mislead people. We at Internal Awareness will never make health claims based on the "color" of the water, during or after a Q2 Session. However, the testimony’s and results of those who have used this system are to the best of my knowledge along with my personal experience are true. I would not invest in a piece of equipment that was bogus. I live in integrity, and have warned many clients to be aware of those who make claims regarding color change of the water. I can get the water to change simply by adding salt, or improperly cleaning the unit or by not using filtered hot water. Unless you can take a sample of this water, and take it to a lab for lab analysis, NO ONE knows what the colors in the water means. However, I can say with all honestly, that the Q2 system has helped me and a countless number of my clients. The other thing I found is many people are advertising and using equipment that has been copied from the original designer. Ask your therapist where they purchased their unit. The equipment used here at Internal Awareness came from Australia. It was purchased it in 1998, at that time it was well over $3,000. Since then many people have copied the design and are selling ineffective equipment.